... but I didn't. I didn't know at all. Maybe I was in denial, maybe I was even a little bit scared, but I truly did not know it was contractions that I was experiencing that Saturday afternoon (November 6th). In fact, I was so confident in the fact that our baby was going to arrive closer to his due date and that nothing had changed within my body that I told my husband he most definitely should go deer hunting with his brother, cousin and uncles for the weekend. After he confirmed the fact that my mom and step-dad would be coming down to stay with me, he agreed that it would be okay for him to head out. On Saturday afternoon, when I began to experience a pain I can only compare to menstrual cramps, my mom told me that I needed to call Monte and make him aware of the situation. I called his cell phone and it rang through to his voicemail, though I didn't leave a message because I knew that he would call back when he saw that I called. An hour and a half later, he called back! Evidently he had been out in the deer stand, and while he gets reception on his cell phone at their hunting shack, out in the woods he definitely does not. I informed him that my mom said I had to let him know that I was having cramps, but told him that I didn't think it was anything important or major and that he was just fine to stay and hunt the rest of the weekend and I would let him know if it amounted to anything more (which I was completely certain it would not). Little did I know that shortly after our phone conversation Monte packed up his stuff and headed home, telling his relatives that he was on his way home because we were going to have a baby. We laid back down and he fell instantly asleep. 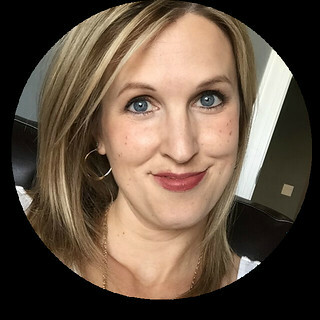 I tossed and turned for awhile before I was able to drift off, only to be waken up three or four different times due to the cramping (which is unusual for me, as even through my pregnancy it was not uncommon for me to sleep through the night). Every time I would wake, Monte would ask me how far apart the contractions were. Still not believing they were contractions, my response was "I don't know! Far enough that we don't have to worry." The next morning we got up and began making breakfast. The pain was coming a little more frequently and Monte asked me to inform him every time I felt it. It wasn't long before we realized that the "cramps" were coming every 10 minutes and that they were getting a lot more intense. When it got to the point that they stopped me in my tracks and I couldn't talk through them, I decided to call the hospital to see if I should get checked. The nurse on the phone informed me that it would be a good idea to do so. At this point my cramps were coming a bit closer together and Monte wrapped his arms around me and said, "baby, you need to pack your bag because we're going to have a baby soon." I finally took his advice and packed my overnight bag for the hospital (I already had everything set out to bring, I just had yet to put it together). Since my mom and step-dad were planning on leaving soon, Monte talked to his sister-in-law, Debbie, and asked if she and Dan (her husband) could come be with the kids for the day, to which they instantly agreed and were on their way. I called the hospital again to inform them that we were on our way in and Monte and I headed out to his truck and loaded up. Right before we left, I started to cry and admitted to Monte that I was feeling really scared. He hugged and kissed me and reassured me that everything was going to be great. Then we started down the road. It took a mere 20 minutes to get to the hospital. We parked the truck and headed up to the third floor where we were taken into a triage room. They checked my blood pressure and then hooked me up to two separate monitors, one which monitored the baby's heartbeat and the other which monitored my contractions. After being hooked up only a few minutes and realizing that the contractions were now only three to four minutes apart, it began to really sink in and I began to accept the fact that I was indeed in labor! The nurse checked me after being there just under an hour and it was confirmed that I was dilated to four centimeters. At that point, I was transferred to a birthing suite where I was again hooked up to the two monitors and introduced to my new nurse. Monte and I got comfortable and turned on the Vikings game, assuming that we still had quite awhile before anything was really going to happen. My doctor came in and greeted us around 1:30pm, checked my dilation (I was at seven centimeters by then) and broke my water and left us in the very capable hands of the nurse, saying he would check on us again around 3:00pm. The nurse asked me if I was ready for my epidural, as this was the pain management plan that I had previously discussed with the doctor. Considering the fact that I was still managing my contractions pretty well, I told her that I would like to wait and see if I can handle them longer without it. My nurse headed out the door to check on something, assuring me that she would be back soon. Monte had yet to eat anything, so he headed down to the cafeteria to grab some food for himself, promising me that he would bring it back to the room to eat, since I really didn't want to be without him. It was at that point, when I was sitting alone in the room, that I began to pray and ask God to show me when a good time for the epidural will be. I asked Him to guide me and keep me and my baby safe and to take away the anxiety I was feeling about the delivery. No more than 30 seconds after I finished that prayer, the most intense contraction I had yet to experience hit me. I tried to breathe through it, I tried to reposition myself, I tried anything I could to make the pain stop but I couldn't help but scream out in pain as the tears rolled down my cheeks. When Monte walked back in the room a minute or two later and saw me leaning forward with tears rolling down my cheeks he rushed to me to see how he could help. My only request: "I want the epidural NOW!" So he set out to inform the nurse that we were ready, and she said she would let the anesthesiologist know and he would be up shortly. 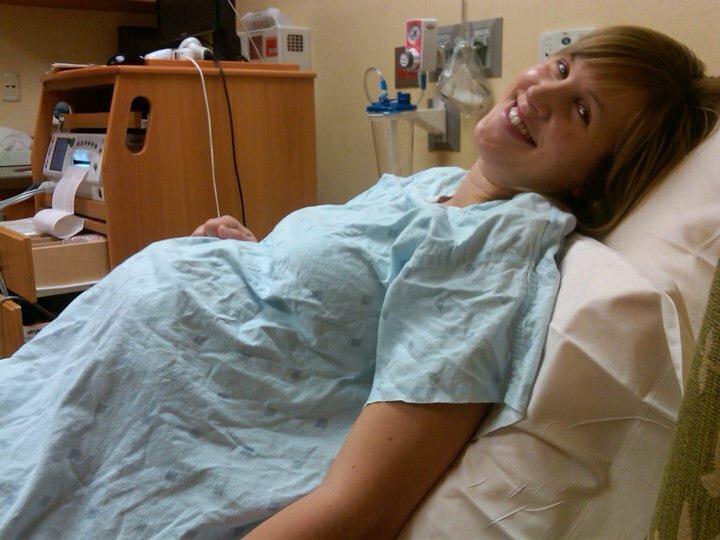 The contractions that came between my request for the epidural and when it actually began to take effect were almost unbearable. My husband was amazing and held my hand and helped me to breathe through them, encouraging me the whole way. I will admit that actually getting the epidural was a painful procedure, but having that needle stuck in my back was nothing in comparison to those intense contractions. It took awhile, but once the epidural began to really take effect and my body started to relax, things seemed a lot easier. I remember that I couldn't feel my legs and I was shivering because I felt so cold, yet my skin was still incredibly warm to the touch. The nurse had to turn me to lay on my side and then on my other side for short periods of time, and that time of laying on my side hurt a lot, as I was beginning to really feel the contractions again. I requested if I could lay down on my back again and the nurse granted that request. After repositioning me, she checked me again and informed me that I was fully dilated and ready to start pushing. According to Monte, this happened around 2:45pm. We decided it was a good idea to shut the Vikings game off so that I could concentrate on pushing ... and considering the fact that they were badly losing and it seemed like they wouldn't be able to come back, I was okay with it being shut off. The nurse asked another nurse to phone my doctor and let him know that we were beginning to push. I don't remember much of the pushing itself, beyond the fact that I feel like it was over pretty quickly, though Monte told me I pushed for roughly 45 minutes before the little guy was born. The one thing I distinctly remember, though, is that Monte and I were bantering back and forth throughout the whole thing, which kept the nurses giggling! He kept saying something along the lines of "just a little more, I see him he's almost here!" after every series of pushes and I finally snapped at him and told him that, unless the baby's head was sticking out he was NOT almost here and that Monte should just stop telling me that! Thank God I have a patient husband who just smiled and kissed me, telling me he's just trying to be encouraging. I remember at one point the nurse put an oxygen mask on me while I was pushing. I don't remember feeling any sort of change from it, but evidently it was needed! My doctor arrived and the pushing continued. I remember them telling me to push harder than I had ever pushed before, and I remember feeling like I was pooping (though they kept promising me that I was not!). My doctor kept telling me to push, but I think it was when he informed me that my baby had a full head of hair that the real inspiration to get him out came. I pushed the rest of the way and the doctor confirmed that indeed my little baby was a boy. 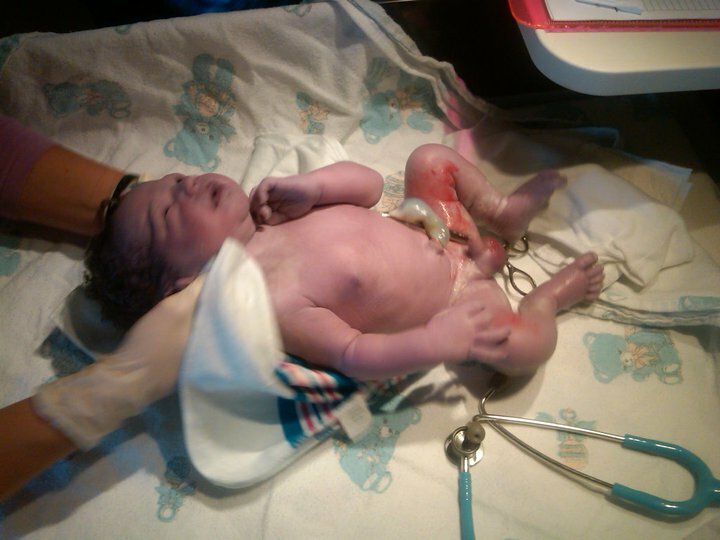 I was flooded with relief after the delivery and began to cry when they laid this beautiful baby boy on my stomach. Monte cut his umbilical cord and the nurses continued to clean him up. I focused my attention on him as the doctor informed me it was time for a half push to deliver the placenta. 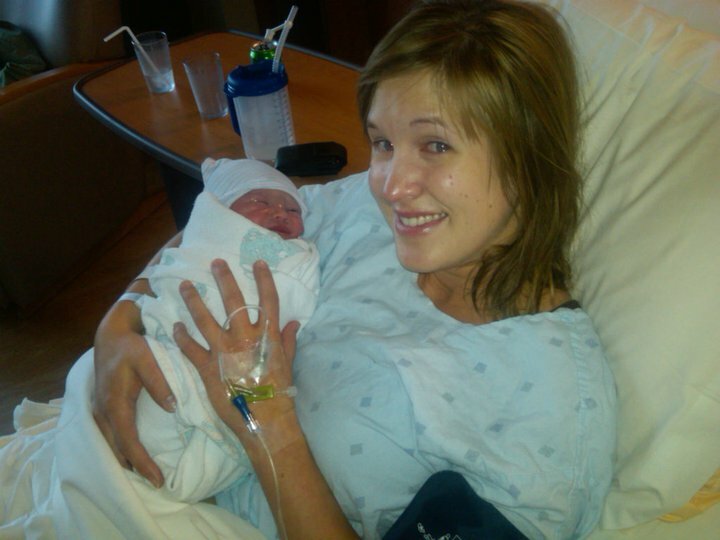 After having just delivered the baby, the placenta was no big deal! The doctor cleaned up, the nurses continued to clean the baby and clean me, and I gave my husband the biggest kiss of our married life! Finally, our precious Ethan Bennett had arrived! There is no feeling comparable to the first time I held him in my arms. God has truly blessed our family with this beautiful bundle of joy!